Two gap-and-go days are quite rare, so I was anticipating a gap fill this morning, which we got right from the open, and which is exactly why I didn't trade it. I'm really starting to question whether I should sit out the first 30 minutes, or just be more cautious during that time. 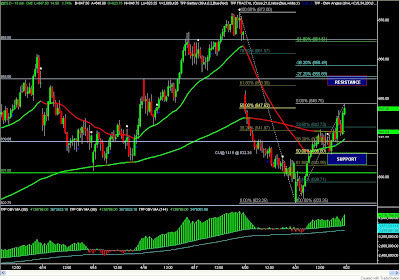 The best trades over the last two days were right at the open. 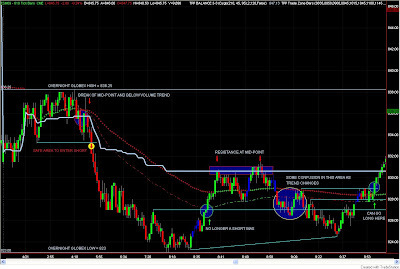 I was able to take advantage of the morning pullback taking some stabs on the short side in the 825-830 area; I was too quick to bail on my trades since staying in the trade too long resulted in losses yesterday. Because of being overly cautious and moving my stop-loss to break-even too quickly, I was up only 2 points in the first hour and it took me a few trades/scalps to get there. Terrible! At the very minimum, I should be shooting for +2 points on each trade, ideally the targets should be +3, +5, +8 pts. Things got better for me after the first hour, and I started trading to the Long side, and made a couple of trades for 2-3 points in the 835-840 area. 839-842 was a resistance zone, and I was able to trade it to the short side, by selling at 840 for +2 pts, and then again at 838.25 for a couple of points. 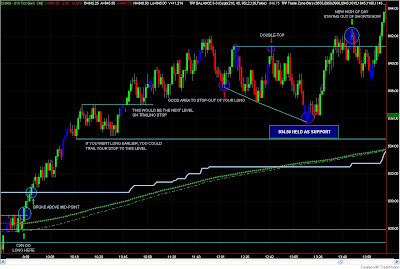 I'm glad I was able to trade it on both, the long and short side, as opportunity presented itself, and I was able to keep the trading/risk fairly tight. I don't know the exact amount of my gain today since my execution platform crashed in the afternoon wiping out the trade history, but I can count at least 5 trades where I exited for +2 points, so I know I was up at least 10 pts; probably more like +13-15 pts today. I experienced some issues with TradeStation this morning, where the charts would freeze or the order execution wouldn't work. I tried exiting one of my trades at break-even but kept getting the "Order Rejected" message, which turned a break-even trade into a 3 point loss. Going forward I'm going to start using the Infinity Futures trading platform in Live Simulation mode. The only drawback is that I won't be able to post a trade chart with the exact entries/exits, which TradeStation plotted automatically for me. 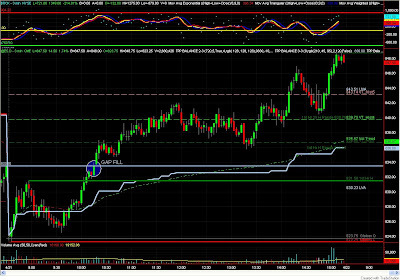 I'll try marking up my trades manually but that could become quite a pain. We'll see. 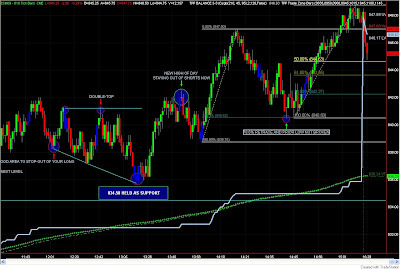 The final point I want to make is, PRICE ACTION trumps all! Being aware of price action (swing highs/lows, higher highs, higher lows, lower highs, lower lows) makes trading a much more relaxed activity since you have TIME to analyze and react to the price action. This is still something I'm working on, and that's why even on days that I don't place any trades, I mark up my charts in order to better understand price action. ES 15-Minute - Price above 34 and 200 EMA. I think you're on the right road with using price action as paramount information. You did well today on your entries and getting out of the ones that were doomed before they cost you a full stop out.